If there’s one building that tells the Spitalfields story, it’s the Jamme Masjid Mosque on Brick Lane. Although only a Muslim house of prayer since 1976, it’s been a place of worship for major faiths – Christianity, Judaism and Islam – for some 250 years. 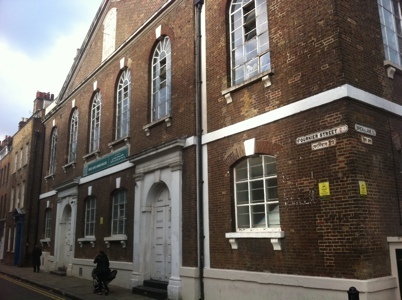 The successive uses of the building, starting with its foundation as the Protestant Huguenot chapel and school the L’Eglise Neuve in 1743, shows, before being used by other Christian and also Jewish groups, illustrate just how much of an impact immigration has had, and changed, the Spitalfields and wider East End area. In the first of three blogs, today I chart the story of the Huguenots that started to arrive in London in 1570s after fleeing Catholic persecution in France. One of the worst atrocities came in 1572 when 2,000 Protestants were butchered in the streets of Paris in a single day. The persecution of Huguenots did ease off, but this respite was only temporary – and in the late 17th century some 40,000 Protestant refugees fled to London. They settled in places on the fringes of the City like Clerkenwell, Soho and, of course, Spitalfields (they weren’t permitted to trade in the City itself). Early immigrants brought with them their French language, which they continued to speak in their communities for a number of generations, but also their Protestant religion. In the Spitalfields area, nine Huguenot churches were built, the L’Eglise Neuve being just one. But what makes it unique is that its use has changed in line with the three significant waves of immigration that I am charting in this series of blogs. Walk down Brick Lane today and what stands is a tall tower, jutting into the sky and lit up in different colours at night, and installed in c. 2009, several decades on from its conversion into a mosque in 1976. But although there have been many modifications over the years, the core of the building remains. The original 18th century features, like a sundial on the facade, hark back to the time when the nearby streets were lined with the terraced houses of silk weavers, the skilled trade that many Huguenots brought with them from continental Europe. At the dawn of the 18th century, 20,000 people living in the area practiced this line of work. Weavers first settled in the likes of Folgate Street and Elder Street, only a few minutes walk from Liverpool Street station. If you look up to the surviving 18th century properties, you can see that the attics have large windows and it was this top floor where artisans worked away at their looms. The buildings that remain were owned more wealthy artisans (the homes of those lower down in the trade have long disappeared), but they give you a flavour of what it must have been like 250 years ago. In time, of course, the rows weavers’ homes stretched beyond just a few streets, with developments spilling over to Brick Lane and beyond. The Huguenots therefore had an enormous effect on transforming an open area of land that once belonged to the Augustian hospital, St Mary Spital (dissolved by Henry VIII in the 16th century) and later an area made up of the homes of the wealthy, like Thomas Gresham wo built the Royal Exchange and others who wanted to be near the docks, into an important suburb. 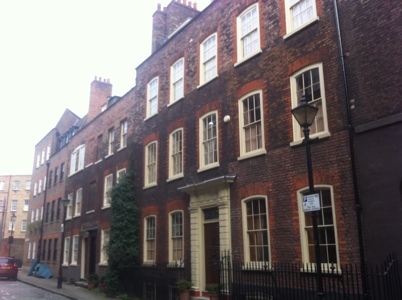 If you go Spital Square today, developed in the 1720s near to where the medieval foundations of St Mary Spital Charnel House can be seen, you get a poignant reminder of where the better off silk merchants and master weavers would have lived (see, for example, the wonderful house at number 37). But sadly the good times for the silk weaving industry wouldn’t last forever in Spitalfields. It went into terminal decline in the late 18th century as workshops were undercut by competition, both from the developing industrial towns of northern England, which used new power loom technology, and overseas. When Huguenot craftsmen moved out of the area, the elegant Georgian townhouses that they’d lived in with their families quickly became slums. Many would in time become homes for Jewish refugees, fleeing anti-semtic pogroms taking place in Russia and Eastern Europe, the next great wave of immigrants that settled in the area. Many of these wonderful houses were almost bulldozed in the 1970s in the name of ‘progress’, but thankfully campaigners fought to keep them. Those that invested in them and renovated them 40 years ago would have made a small fortune if they sold them today, given their close proximity to the City. And as the make-up of the East End population changed significantly over the course of the 19th century, the Huguenot church on Brick Lane followed the waves of immigration. After passing through a number of Christian denominations in 1897 it became a synagogue. Looking at an inscription on the surviving sundial on the front of the L’Eglise Neuve you could argue that the Huguenots always knew their presence in Spitalfields would be temporary. ‘Umbra sumus’ (‘we are shadows,’) it says poignantly. An excellent piece but in need of one small correction: the “tall tower, jutting into the sky and lit up in different colours at night” outside the Jamme Masjid mosque was NOT put there in 1976; it was actually erected in c.2009 by a notorious local politician seeking (re)election and paid for out of £600k of public money, which ought to have been spent on something useful, like public toilets. This artistically bereft carbunkle is, according to Tower Hamlets Council, “not a minaret” but a “large steel art sculpture”. They say that despite it being quite obviously a minaret; much in the same way a tower attached to a church is universally regarded as a “spire” or a “steeple”. To further undermine their excuses, this “cultural” building is topped by a religious, not a cultural symbol – the crescent moon, the symbol of Islam – thus making their denials appear all the more incongruous. The council is so keen to deny what is clearly apparent to anyone with at least one eye because, at the time, it was illegal for a local authority to spend public money on religious buildings or parts of religious buildings. Nowere is George Orwell’s dystopian blackwhite* concept more alive than in 21st Century Tower Hamlets.